Looking for a quick lunch? 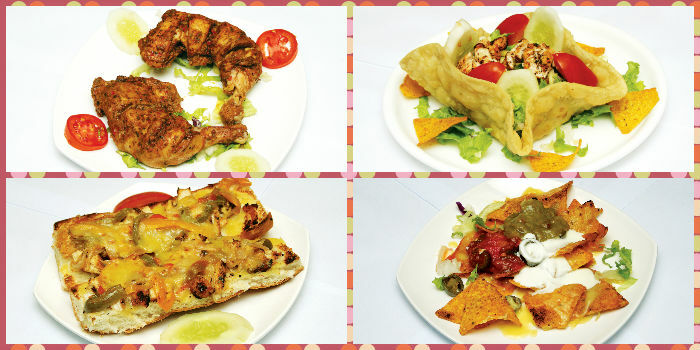 The Mexican Griller in Nungambakkam might be your answer. Situated opposite jewellery address Rasvihar, this restaurant, barely a few days old, has something fun for your taste buds. The Mexican Griller features a Tex Mex menu or the Americanised version of Mexican cuisine. So, if you are not expecting something gourmet but plan to catch up with friends over something to eat, step right in! The head chef and co-owner, Karthik Karuppiah, started this place along the lines of a Mexican eatery they trained in at London more than five years ago. The idea was to offer healthier versions of burgers and other fast foods. The place has a great selection of grills, sandwiches and burgers, most of which are grilled and not fried. For instance, they offer grilled chicken wings instead of its fried avatar. You have the usual sides and appetisers like corn chips served with guacamole, sour cream or salsa and nachos topped with veggies and chicken. The topping on the nachos may have hints of Indian flavours, but tastes good nevertheless. If you are fond of meat, the lamb burger with a patty done perfectly is a must try. Also watch out for the chicken griller done with three different sauces a�� jerk sauce, Mexican hot sauce and spicy hot sauce. We like that all the sauces are made in house and they serve their burgers open faced. Interesting desserts that will soon be added to the menu are the Mississippi mud pie and the chocolate mousse. A nice place for friends and family and a good option if you are on a budget.